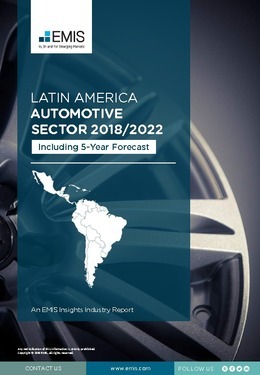 Latin America is well integrated in the global automotive supply chain, being an important manufacturing and export hub for motor vehicles – the legacy of active government policies for the development of domestic production and comprehensive free trade agreements. In 2017, the region accounted for 7.5% of global motor vehicle output and exported vehicles for a record-high USD 81.5bn, mainly destined to countries in the Americas and Europe, but also to Africa and Asia. Moreover, the relatively young and growing population, which reached 653mn people at end-2017, the rising purchasing power of households, and the government focus on development of the transport infrastructure have turned Latin America into one of the fastest growing new vehicle markets in the world, absorbing 6.3% of the global vehicle sales in 2017. This report provides a complete and detailed analysis of the automotive sector for [country name]. EMIS Insights presents in-depth business intelligence in a standard format across countries and regions, providing a balanced mix between analysis and data.